The Hunger Games: Catching Fire was probably the biggest surprise for me at the movies in 2013. While I didn’t hate the first film in the franchise by any means, its sequel was able to expertly enhance the strongest aspects of the established world and new and interesting risks. Katniss, played by Jennifer Lawrence, is easily one of the strongest female heroines in modern blockbusters, and Catching Fire adds a fascinating extra depth to her character that also enriches everyone around her. Today this wonderfully executed sequel is set to hit shelves on Blu-ray and DVD, and in celebration we have four exclusive sneak peek photos that take us behind the scenes. Let’s start at the top, shall we? 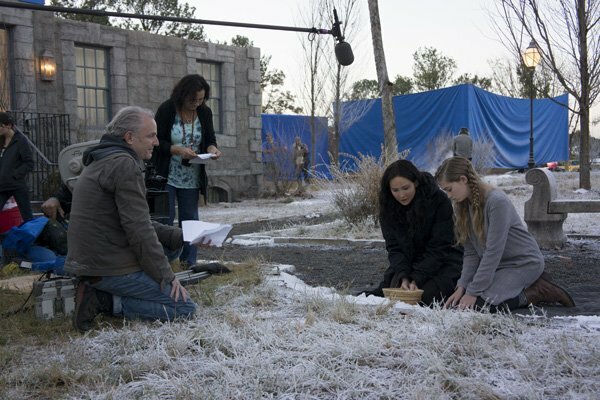 Brought to life in this shot is Jennifer Lawrence shooting a scene alongside her movie-sister Willow Shields. Taking the two actors through the scene – dailies in hand – is director Francis Lawrence, who is sitting just outside the shot, accentuating the intimacy of the moment in the film. From a quiet moment in District 12 this next shot is from the set of Caesar Flickerman’s show as he interviews all of the Hunger Game contestants. While it doesn’t look like they are actually filming in this photo, you can see both Stanley Tucci and Sam Claflin dressed in full costume having a chat. It almost feels weird seeing Tucci wearing the costume and not a big tooth-filled grin. 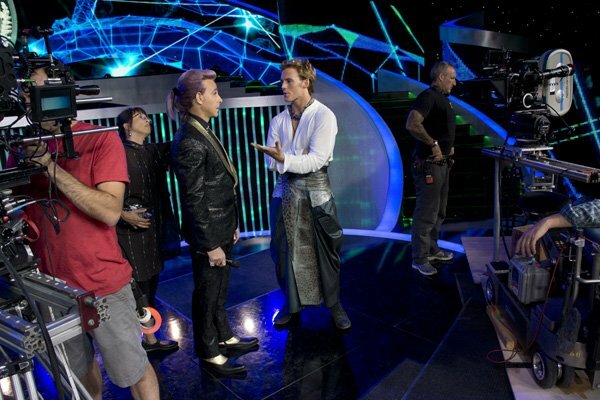 Speaking of Finnick, we have another shot of Claflin here, though this one has the actor in a very different costume. This photo was taken while the production team was filming sequences in the arena, specifically around the Cornucopia where all of the weapons are stored. 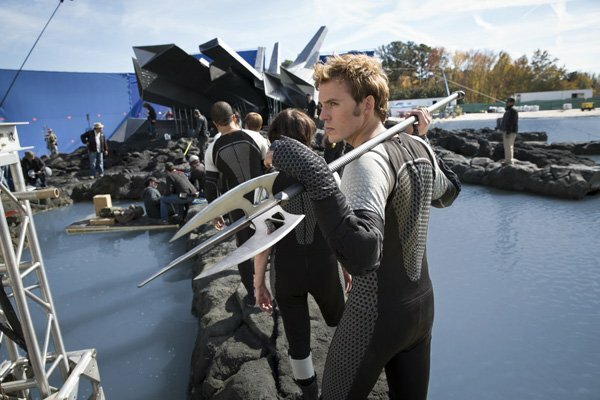 As you can see, Finnick has already picked up his trusty spear. Finally we head back to District 12 where we basically have a meeting of supporting characters. Taking the spotlight with her naturally-ridiculous costume is Elizabeth Banks as Effie Trinket, but you can also once again see Willow Shields and Primrose, and Paula Malcomson as Katniss and Primrose’s mother. Also, if look very closely on the left side of the image you will also see an out of focus Lenny Kravity, playing Cinna. This is a fun look at Hunger Games past, but it won’t be long until we hear more about the franchise’s future. The third installment, The Hunger Games: Mockingjay – Part 1, will be in theaters on November 21st, while Part 2 is set for November 20, 2015. Stay tuned in the coming months, as it may not be too long until we see our first trailer!